Crazed Physicist, the only thing left in the mind of Myrd Skyintis aka Mad Scientist, a Planeswalker born in New Ravnica. 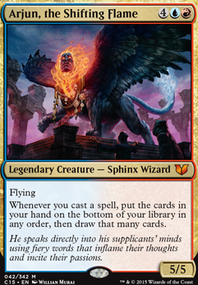 This character was Niv-Mizzet, Dracogenius ' protege, until he was discovered secretly having studied under Lazav, Dimir Mastermind as well. Much turmoil, both personal and political followed Myrd after this discovery. Both Guilds wanted to know how many secrets Myrd discovered. The young walker became a high prized target by bounty hunters and governors alike.. During his escape from Dimir and Izzet controlled territories. 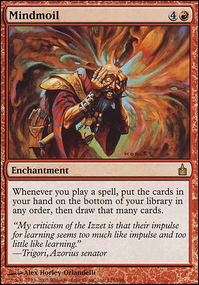 He mind battled the mages that prefer mental infiltration and not to down-play the out-right controlled chaos physically being brought against him from the Izzet. This was plenty of stress for his Planeswalker Spark to ignite. Instead of trans-versing the planes, he was sent back decades before his Treachery was discovered, or even, himself conceived. ** This allowed his indiscretion to be unnoticed by all, all except, Jace Beleren . Jace approached Myrd and attempted to train this curious and powerful mind. However, the strong will and illogical thought pattern drove Jace insane and he was unable to help the Time Stretch ing Planeswalker. Due, to the lack of a mentor, it was a decade before he was able to hone his skills. ** Myrd quickly became the eager student of a visiting walker Dack Fadden, a thief by trade. Dack taught his pupil not only the finer points of walking from plane to plane, but to become a master thief as well. The items that Myrd obtained ranged from fine trinkets such as a prized Gilded Lotus , to the minds of any that opposed him. He became such a star pupil, even his Blatant Thievery would go unnoticed. This walker had been brought to the end of the abyss of existance and was ripped back by his old friend Bronson. About the deck: My original R/U deck was a time magic based EDH. I dubbed the deck Mad Scientist. Great cards that gave me an amazing infinite loop of turns. Creating Magic Solitaire. The pre-made Seize Control Commander deck was my reason for creating a new R/U. However, I have a hard time using any of the original cards I had once played with. So, if your deck is your mind, and I had lost my mind, now parts had returned, but the mind is never what it used to be. Hence the theme of the deck. This is the mind of a brilliant man that had been shattered.